We show you how Zotero can turn Firefox into the ultimate research tool. Hundreds of useful add-ons are included in the official repository of Firefox extensions. Some of them are clever one-trick ponies, whereas others add radically new functionality to your favorite browser. Zotero  belongs to the latter category. This extension turns Firefox into a powerful tool that can handle a wide range of tasks – from research and archiving, to generating bibliographies and managing notes. Add to this the accompanying web service, which lets you sync your Zotero data between multiple machines, access your data via the web, and collaborate with other users, and you've got the ultimate tool for all your research needs. Figure 1: Zotero turns Firefox into a powerful research tool. Although Zotero works fine as a standalone tool, you should create a free account with Zotero's web service to help unleash its full potential. Then you can install the latest version of the Zotero extension from the project's web site. Before putting Zotero to some practical use, you should configure its settings. To do this, Choose Tools | Add-ons, select Zotero in the list of installed extensions, and press the Preferences button. 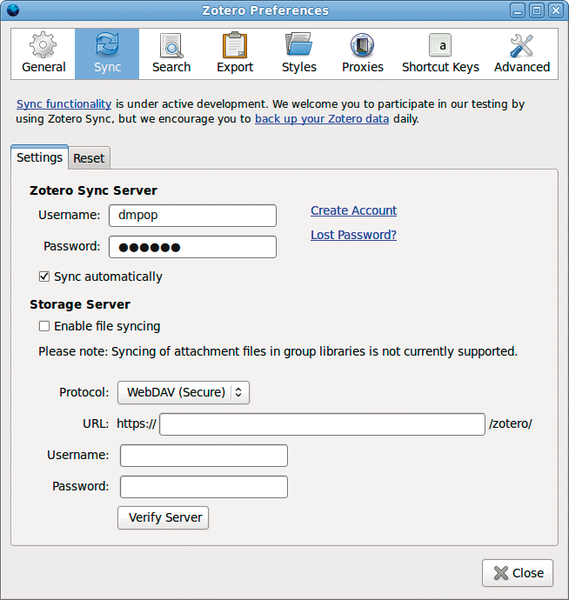 Switch to the Sync section and specify your credentials in the Zotero Sync Server group. Figure 2: Configuring Zotero's settings. Although Zotero's synchronization service can't handle attached files, the extension can use a WebDAV server to store and sync files and documents in your library. To enable this feature, tick the Enable file syncing check box in the Storage Server group and specify the required server settings. For indexing PDF files, Zotero relies on the pdftotext and pdfinfo utilities, so if you plan to use Zotero to manage PDF attachments, you can install both utilities in the Search section. Simply press the Check for installer button, and Zotero will take care of the rest. By default, Zotero stores all data in the Firefox user profile directory, but you can specify an alternative location in the Advanced section. Tick the Custom button in the Storage Location group and specify the path to the desired directory. Once you're done configuring Zotero's settings, press Close and Zotero is ready to go. To bring up Zotero's interface, click on the Zotero button. All items such as web pages, notes, and bibliography entries are organized in Zotero into so-called collections, which you can think of as folders you can use to group the collected items. Before you start populating Zotero with data, it's a good idea to set a few collections. 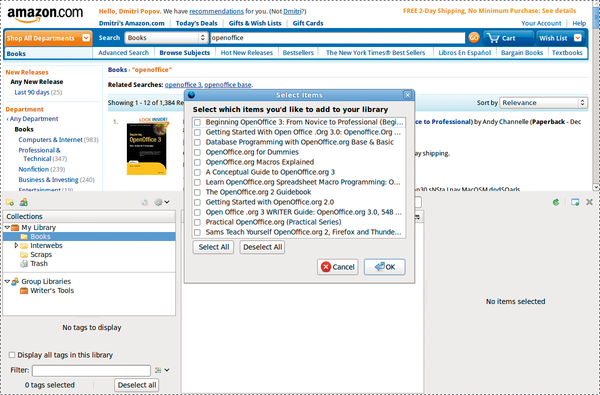 To create a collection, right-click on the My Library item and select the New Collection item. In a similar manner, you can add sub-collections by right-clicking on the collection and selecting New Sub-collection. Zotero offers several ways to capture and add data to the collections. Let's start with the most simple one – notes. Select the collection or sub-collection where you want the note to appear and press the New Standalone Note button in Zotero's toolbar. This adds a new note to the list pane in the middle, and you work on the note in the editing area to the right. The editing pane sports a WYSIWYG toolbar that offers all the essential tools for formatting your notes, including different text and paragraph styles, text and background colors, lists, and links. If the editing pane feels too cramped for comfortable work, you can detach it by pressing the Edit in a separate window button. Like any modern data management application, Zotero supports tagging. To assign one or several tags to the note, click on the Tags field and enter as many tags as you like. All tags assigned to the items in your library appear in the left pane below the list of all your collections, and you can use the tags to filter and locate the items you need quickly. To do this, click on one or several tags in the tag list, which automatically displays items with matching tags. If you have dozens or even hundreds of tags, you can narrow the tag selection using the Filter field. When you start typing Zotero automatically displays tags matching the typed string. Type, for example, am and Zotero displays the amazon, amtrak, and american tags. In addition to tags, Zotero lets you interlink notes and other items using the Related feature. This feature can come in handy when you want to connect conceptually similar notes. To link two notes, click on the Related field in the source note. In the Select Items dialog window, select the target note and press OK. This way, you can link as many notes and other items as you need. Saved searches is yet another feature that can help you quickly find items in your library matching specified criteria. A saved search appears in the list of your collections as a virtual folder containing the matching items. To create a new saved search, right-click on My Library and select New Saved Search. This opens the Search dialog where you can specify one or several search criteria. Besides notes, Zotero allows you to capture and annotate web pages, which effectively turns the extension into a handy web archiving tool. Capturing the currently opened web page is as easy as hitting the Create New Item from Current Page button in the main toolbar. This automatically adds a new item to the currently selected collection with an attached snapshot of the web page. As with any items in Zotero, you can tag and link the created web item as well as view the attached snapshot in the browser. Moreover, you can annotate the opened snapshot and highlight desired passages using the tools in the Annotation toolbar. Zotero's ability to capture and manage bibliographical data makes it a rather powerful research tool. 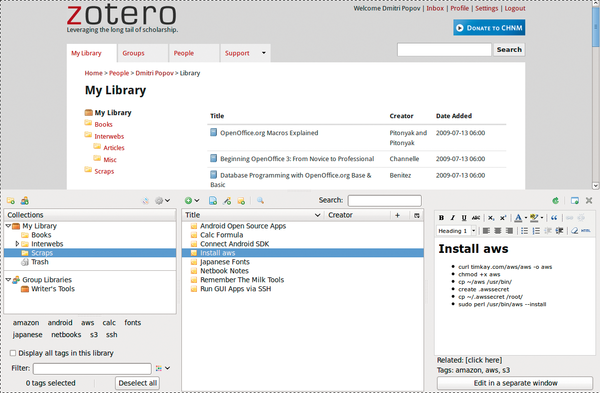 Zotero features dozens of so-called site translators that can capture bibliographic information from a wide range of web services such as Amazon, Google Scholar, Answers.com, BBC News, and many others . When Zotero senses a compatible page, it displays an icon in Firefox's Address bar. Click on this icon and Zotero automatically adds the item to the currently selected collection and fills out the appropriate fields with the extracted bibliographic information. Better yet, it can detect and handle multiple entries at once. To see how this works in practice, do a search for specific books on Amazon, then click on the Book icon in the Address bar, and Zotero lets you select multiple entries and insert them into the current collection in one go. Figure 3: Zotero can extract bibliographical information from compatible web sites. You can also add a bibliographic item by its ISBN number, Digital Object Identifier (DOI), or PubMed ID. To do this, press the Add Item by Identifier button in Zotero's main toolbar, enter the identifier, and press OK. Zotero then inserts the found item in the selected collection. In addition to tags and related items, bibliographic entries support file attachments. You can use this feature to attach a PDF copy of the article to the appropriate item in the collection. To add an attachment, select the collection item you want, switch to the Attachments section in the editing area, and press the Add button. Here you can choose between two commands: Link to File and Store Copy of File. The former allows you to link to a file or document on your machine, whereas the latter imports the file into Zotero's library. Besides keeping your data in sync, Zotero's web service lets you access your library from the web and share data in your Zotero installation with other users. To do the latter, you have to create a group and invite users. Creating a group is a matter of finding a name for it, providing a description, and choosing its type (public or private). Once the group is created, it automatically appears as a collection in the Group Library section of the Zotero extension. All items you add to this collection are automatically shared with the group's users. Figure 4: Using Zotero's web service. Inviting users to your group is easy, but they must be registered with the Zotero service. To find the user you want, switch to the People section in Zotero's web interface and click on the Search for people link. Then use the Invite button to send the person an invitation to the group or use the Follow link to subscribe to the user's updates. Zotero offers several ways to generate bibliographies from the existing collections, the easiest of which is to use Zotero's Drag and Drop Quick Copy feature. As the name suggests, you can use it to insert a bibliographic entry by dragging an item from a collection onto the desired place in your document. Zotero even formats the entry according to the specified citation style that you can define in the Export section of the extension's Preferences window. This approach works best when you need to insert individual bibliographic entries every so often. But if you want to generate a full bibliography from a specific collection, you can do so by right-clicking on the collection and selecting the Create Bibliography from Collection command. Then choose the desired citation style and output format and press OK. If you select the Create Report from Collection command instead, Zotero will generate a nicely formatted print-ready HTML report. Zotero sports another feature called Timeline, which can be used to present the library as an interactive timeline. This feature can be useful when you need to locate books and articles published in a given year or other specified period. To generate a timeline, press the Actions button and choose the Create Timeline command. 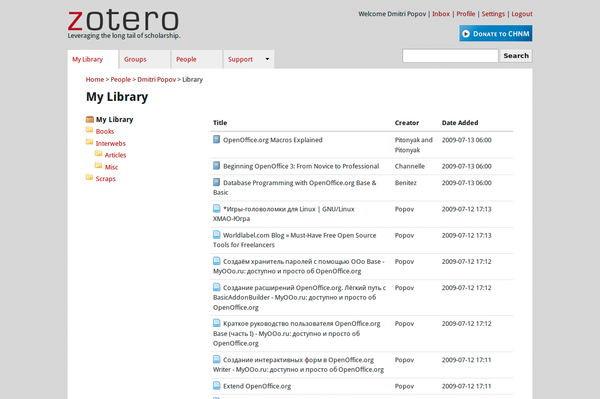 In OpenOffice.org, you can use Zotero as a bibliography back-end, courtesy of the Zotero extension for OpenOffice.org. Once installed, the extension adds the Zotero toolbar to Writer containing several buttons, including Insert Citation, Insert Bibliography, and Set Document Preferences. The latter allows you to configure settings such as citation style, the way citations are displayed in the text, and formatting options. To insert a citation, press the Insert Citation button and select the desired publication. Before you hit the OK button, though, there are two other options you might want to specify. If you want to include, for example, the page number, you can do so by selecting the Page item from the drop-down list at the bottom of the window and enter the page number in the field to the right. To specify multiple citation sources, press the Multiple Sources button and select the publications you want. Finally, press OK to insert the citation. Generating a bibliography is even easier: Place the cursor where you want the bibliography to appear and press the Insert Bibliography button. The inserted bibliography updates itself automatically, so when you insert a new citation, the source publication is automatically added to the bibliography.